Tyler Ferrara, journalism student at Southern Connecticut State University, reported this story in 2017 as part of Journalism Capstone coursework on World War I. Five windows, immortalizing the life of a Hamden war hero, Major A. Frederick Oberlin, surround visitors on the second level of a two-story rotunda in Memorial Town Hall. In 2017, only two offices remained in Town Hall: the fire department’s administrative office and the legislative counsel’s office. Every other office and department has moved to the Government Building located on 2750 Dixwell Ave., which is just a third of a mile down the road. 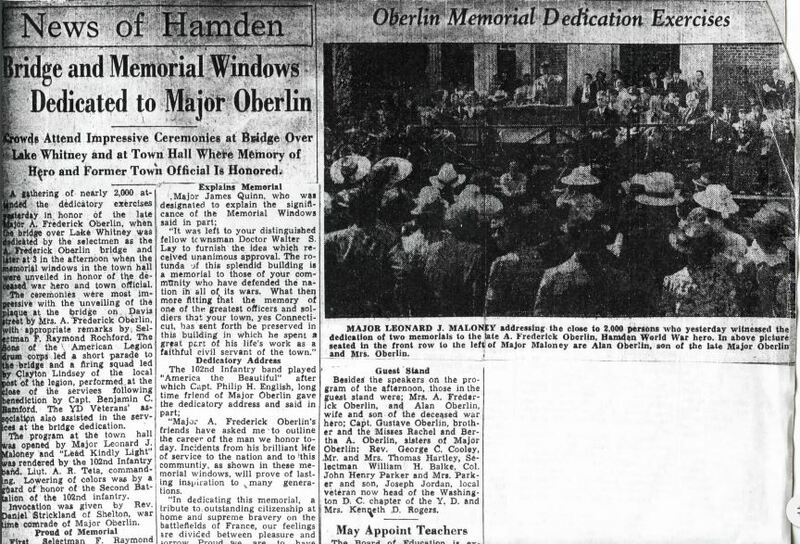 According to Beth Shutts, the Hamden Historical Society archivist, the windows were installed in 1939 and dedicated in honor of Oberlin on June 25 of the same year. Oberlin was not only known as a soldier, he was an engineer who helped build the Davis Street Bridge and Town Hall. The bridge would be dedicated in his name on the same day as the windows, each of which detail a different story about Oberlin’s life. Read more about Oberlin in an academic paper by Laura Macaluso, a Southern Connecticut State University graduate. The left-most window depicts the old Town Hall, where Oberlin started his engineering career, along with an image of a young Oberlin. The second window, working toward the right, is a representation of the Battle of Seicheprey, where Oberlin and the 26th Infantry Division fought the Germans. 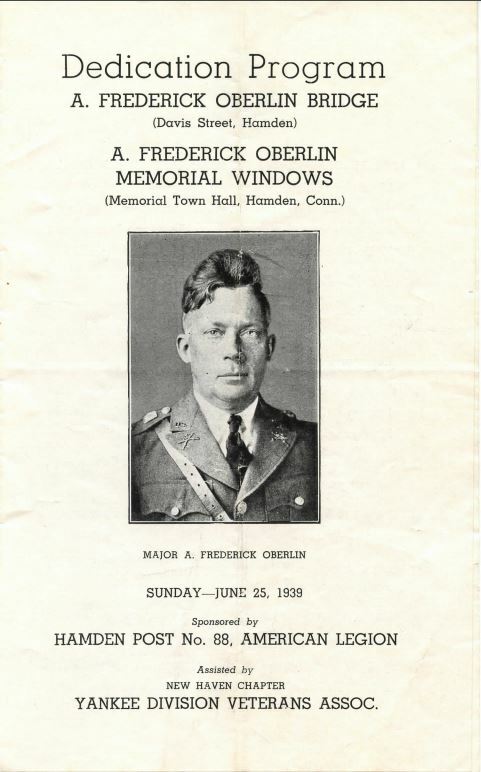 The middle window shows Oberlin standing alongside the 102nd Regiment insignia. The next window illustrates the raid at Saint Hilaire, where the 102nd Regiment captured guns and ammunition from the Germans, according to Lupi. The right-most window paints an older Oberlin working on the Davis Street Bridge. In a news article from June 26, 1939, the day after the dedication, Major James Quinn described the windows to the 2,000 people. “The memory of one of the greatest officers and soldiers that your town, yes Connecticut, has sent forth be preserved in this building in which he spent a great part of his life’s work as a faithful civil servant of this town,” Quinn was quoted as saying. The display includes limestone memorials listing names from World War I, World War II and the War of 1812. Below the quote is 13 names of local soldiers who gave their lives in WWI. Most recently, the town has added a memorial wall for Operation Enduring Freedom, and a wall for Captain Benjamin A. Sklaver, who gave his life on Oct. 2, 2009, while serving in Afghanistan.